Short story collections are often titled after one of the collected stories. 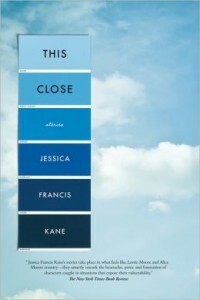 Jessica Francis Kane’s new collection “THIS CLOSE,” following her 2010 novel, The Report, doesn’t share a title with any of the stories within, but it nicely delineates the theme the stories are organized around: relationships with unclear boundaries. The characters in these stories struggle to determine the right amount of closeness, asking: Is this too close or not close enough? Kane writes with a wonderful clarity. The characters may feel uncomfortable or unclear about their relationships with one another, but the reader never does. Reading these stories is something like looking through correctly calibrated lenses: you can see things you might otherwise have missed. In “Lucky Boy” a collection of vintage evening purses is described as “little sequined clam bellies, glinting in the sun.” In “The Old Beginning,” a cat is a “marmalade lump.” Because the writing has a lovely transparency, the stories may give the impression of being simple: they’re not. They’re skillfully wrought pieces by a writer who knows exactly what she’s doing. The first story, “Lucky Boy,” takes place over a long stretch of time and tells of the main character, Henry’s, transformation into both a New Yorker, and an adult for whom human interactions aren’t always clear. Henry moves to New York in his twenties. “I settled in over the 4th of July weekend,” he says. “Christina, a friend from college, gave me a list of things to accomplish. She was both a native New Yorker and very beautiful, so I paid attention to everything she said.” He finds a dry cleaner that weekend – one of the things on Christina’s list – whose proprietors figure large in Henry’s life for a time. They are not quite strangers, not neighbors, not friends – there is no earned closeness between them – but there is a closeness nonetheless. The dry cleaners offer an “exchange of services” that makes Henry uncomfortable, first because he feels he may be taking advantage of them, later because they take advantage of him, asking him to take a young relative to play catch in the park, an arrangement they then assume will happen every week. They presume a relationship Henry hasn’t agreed to and doesn’t quite know how to get out of. I found it a little hard to see Pat – not all the clues to her character added up for me. People who’ve lived in one place a long time don’t tend to feel self-consciously virtuous about things like their public libraries. And her physical description, the things she notices about herself – “…her thin damp hair, …her neck where it thickened when she took a drag on her cigarette. She was forty-eight and it was hard to believe she’d be in the car in twenty minutes wearing lipstick.” – didn’t ring true, sounding to me like someone younger describing the way an older woman would view herself. But the reason Pat offers a piece of her property to this stranger really has nothing to do with virtue, though she doesn’t acknowledge it at first. She wants a little buffered distance from her new neighbors, the Conways, who’ve bought the house next door. The Conways are the kind of young couple who gentrify older, more working class neighborhoods (a place beautifully described by Kane “at the height of summer, driving through on the main road, the effect was of green abandon, particularly after a rain.”)The two women are opposites and don’t really know how to talk to each other. And they are competitive about the closeness of their respective interactions with Kirill. Neither knows how to strike the right note with this person who can’t be defined; who is neither friend, neighbor, colleague, servant or, as he informs the two women in a nice twist, either one’s gardener. Kirill is the one who pushes both women away when they attempt to claim a closeness with him that doesn’t exist. Many of these stories are about ill-defined interactions or relationships and the discomfort the absence of clear boundaries can cause . And many of the central characters are mothers, perhaps because the changing nature of motherhood, its necessary re-invention as children grow up and away, is tailor made for stories about closeness. A group of young adults invites the mother of one of their friends to dinner after the friend’s death – when the woman no longer has a place or purpose in their lives. Another woman distances herself from her family by drinking. And in the beautiful “Next in Line,” a woman tries to find her way back to marital closeness after the death of her child. The final three stories concern the same family at different periods of time – John, Elizabeth, daughter Hannah – and how they each define or attempt to redefine the parameters of close relationships. Kane handles the back story nicely, in a paragraph that touches on Elizabeth, their life at home, Hannah’s bafflement as she felt “the energy drain out of the house,” then returns to Hannah and John in Jerusalem, Elizabeth distant in more ways than one. Father and daughter meet up with Rosa, a tour guide John met on a previous trip and with whom he has been corresponding. The relationships – between Rosa and John, Hannah and John, John and Elizabeth, Hannah and Elizabeth – are all question marks, uncomfortable, not clearly defined. Rosa asks Hannah if her father would like to go to the spice market. “It was the sort of question her mother would answer if she were here, not anything Hannah had had to consider before.” She is called upon to fulfill her mother’s role as the person who knows her father best, something at which she can’t succeed as she will never share the history her father and mother do..
Later, John bargains with a merchant for some watercolors he wants to buy. Her father’s voice, to Hannah “was completely new to her.” There are parts of him she doesn’t know and is surprised by, as later, her mother will also be. Is it possible, the story asks, to really know even those we’re closest to? The morning after their arrival at the beach house, Elizabeth is taking a bath when John goes upstairs, needing to ask her a question. “If he talked to her through the door, she would ask him to come in. If he refused, she would get angry; if he obliged, he knew he would not be able to look at her in the water with the love and desire she craved.” Their relationship has changed, their closeneness and love, diminished by Elizabeth’s inability to cope with daily life, an inability that is presented but never explained. Nobody does. The opacity of human thought and intention is the real subject of the stories in this book. Even with correcting lenses, a person can be too close or too far away to see clearly.